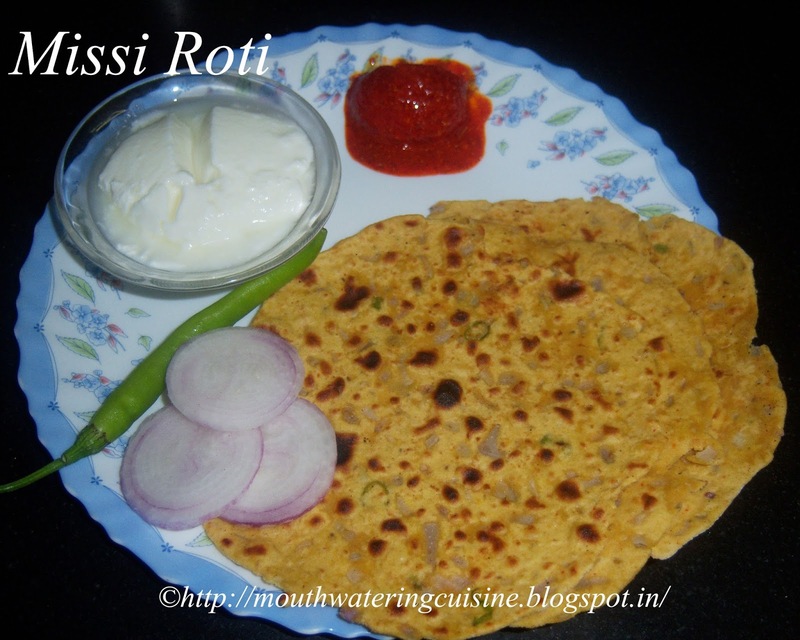 Missi roti is a healthy and traditional Punjabi recipe. I have the habit of buying Woman's Era and pick recipes from it. I have a good collection of them, when sorting them I had a glance at different varieties of roti making. I picked it from them. I prefer to make such kind of rotis instead of making regular plain wheat flour ones. It is made with wheat flour and besan or chickpea flour combined with flavorful ingredients.Making them is very easy and takes very less time. In a large bowl mix wheat flour and chickpea flour. Add chopped onions, green chillies to it. Add salt, red chilli powder and ajwain. Mix well. Add water and make soft dough. Make soft and pliable dough. Add oil to it and knead well. Cover and allow the dough to rest for fifteen minutes. Divide it into equal portions of the dough. I got 9 of them. It may increase or decrease, depending on the size of the roti. Roll them into round and thin chapatis of 6" diameter or even more of course, with the help of rolling pin. Heat tawa and place roti on it and cook for two minutes. Once brown spots on it appears, flip and cook for two more minutes. Grease with oil or ghee and cook for a while. Serve hot missi roti with any pickle and curd.